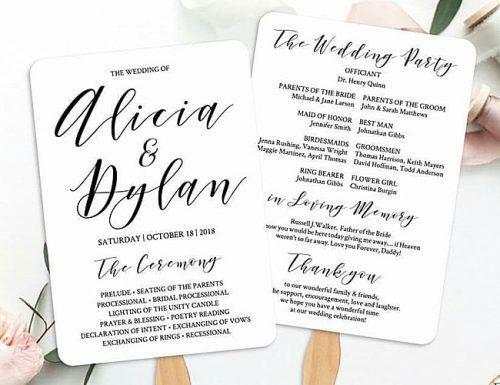 No doubt, the wedding program wording by default is to have a seamless flow. In particular, this is because the wedding program is what will guide your guests all through your event. And some couples choose to use wedding program fans instead of the standard style for wedding programs. 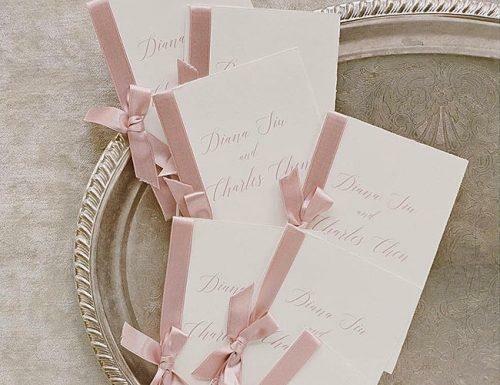 So, whichever you choose, allow us to help you navigate the maze that is wedding programs etiquette. First of all, if your wedding program is not a one-pager and has a cover, you are going to need to decide the wording. In general, a typical wedding program cover usually has a beautiful wedding-themed background and simple wording. While some people choose to scribble the name of the couple across it, others prefer a little creativity. Today I will marry my friend. God bless our wedding day. Two hearts united in love. 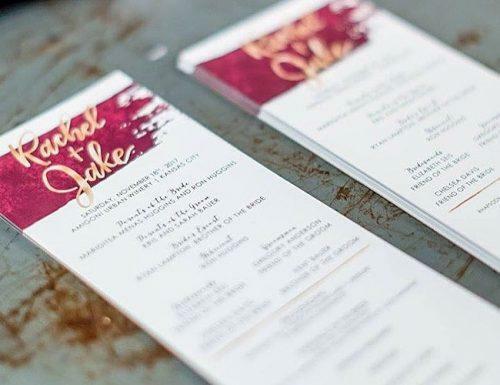 Then, upon opening the program, guests should see vital wedding program information. 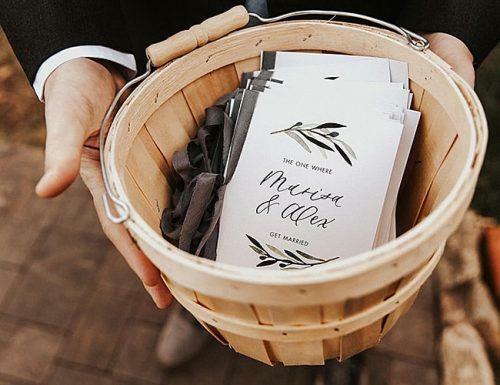 Generally speaking, basic wedding program wording would have the full names of the bride and groom, date and location of the wedding, and order of the ceremony. Just like the importance of the credits in a movie, your wedding program would need to include a list of the participants in your wedding. In particular, this would be the names of family and friends who contributed to the execution of the wedding. The names of each participant should be spelled in full. If this is a DIY wedding program, these are always fun to make. At this point, however, you might have some extra space, which would look awkward without some few words. Thus, here you can include fun facts about you and your fiancé, or some historical facts about the venue. You can also include some much-needed information on the wedding reception or the hashtag for your wedding on social media. A traditional wedding program has a final message at the end, which is usually a thank you message to all guests. In other words, this message is basically an appreciation for everyone who took the time to be a part of your celebration and your union. In addition, there is sometimes also a message for those who have passed away and everyone wished could be a part of the wedding. Below are samples of wedding program wording for your reference. They can serve as wedding program fan template program for wedding or wedding bulletins examples. However, these are mainly sample wedding program wordings. Bride and Groom names, date, ceremony time, the location of the ceremony including city and state. Prelude: Music plays in the background while guests settle down and find their seats. Seating of Bride and Grooms Parents and Grandparents. Bridal Party Procession: The bridal party comes in. Bridal procession: The bride comes in on the arm of her father or male representative. Sand ceremony (or any traditional/religious step required in your wedding): Depending on the religion or tradition, some ritual may be inserted here. Could be jumping the broom or a lighting a candle. Prayer, blessing or reading: Reading of a poem or verse by friends or family. Kiss the bride: The couple is presented to everyone as a man and wife, and the groom kisses his bride. Recessional: The couple exits the ceremony. Reception Information: Any important information on the reception, like the time, venue, and seating arrangement. Final message, poems or scripture. This personalizes the wedding program. Moreover, it is a chance to add some words unique to the couple. It is also a chance to include some words in memory of lost loved ones. E.g. Thank You: E.g. Thanks to our family and friends who have chosen to celebrate this wonderful day with us. We wish you as much love in your lives as you have shown us, and we wish you a safe journey home. New Address: Some couples find fun ways of including their new home address in the wedding program. This makes it easy for family and friends to reach them afterward or forward gifts. 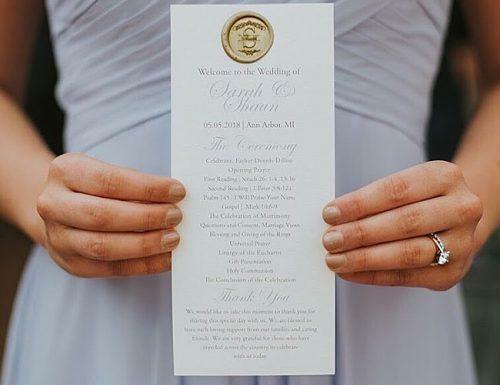 The opening for a typical wedding program includes the things such as the Bride’s first and last name, the Groom’s first and last name, month, day, year of the wedding as well as the time and the ceremony venue. In fact, this is the main body of the wedding program. It details the points of the ceremony from the entrance of the bride up until the exit of the couple after they have been joined by the officiant. Opening music: The music that plays while the guests get settled. Processional: The bride and her bridal party come in, in the order, they have chosen. Opening Words by the officiant: A few words about the couple and their union are said by the officiant. Readings: Poetry or verses read by loved ones to the couple. Wedding Message: The officiant reads his message which is usually blessings and words of advice to the couple. Vows: the exchanging of vows and rings by the couple. Presentation of the couple: The officiant presents the couple to their guests, and they kiss as man and wife. Exit by the couple: This indicates the end of the ceremony. Just like participants, the wedding party is listed in detail in this section, their names captured in full and in the following manner. 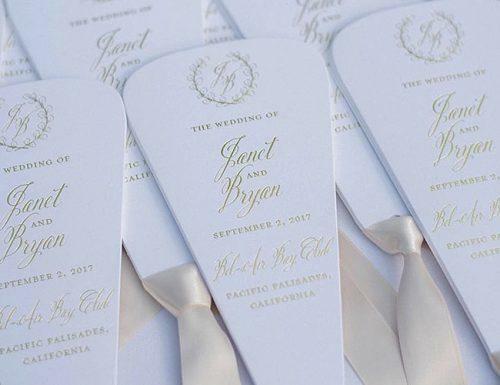 There are a few points to look out for on the topic of wedding programs etiquette. In addition, this would help you avoid any obvious faux pas in this section of the wedding. Who Receives A Wedding Ceremony Program. The recipients of the wedding ceremony programs are the guests at the wedding. This would include any performers or speakers so everybody attending is aware of what happens when. Nobody should be lost or left out on your big day if they have your wedding ceremony program. Who Hands Out Wedding Programs. The wedding programs are handed out to the guests by the ushers at the wedding. In an event where there are no ushers, family members like cousins, nieces or nephews of the couple usually handle this. When To Order Wedding Programs. It is essential to order wedding ceremony programs in good times since these are vital to the wedding. Wedding programs should be ordered 1 – 2 months before the wedding and should be ordered with a little extra. This is so that you do not run out, and you have the most and – by before the set date of the wedding. All in all, your wedding program should be clear, concise, and able to lead your guests from beginning to end of your day easily. 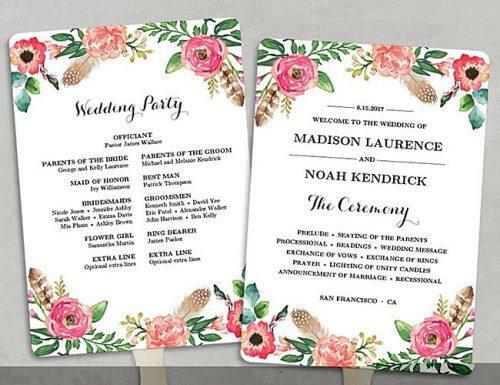 This is why asides the design, color, and structure, you need to prepare your wedding program wording. However, one of the factors which make your special day complete, it should not be left to last minute. Therefore, take your time, decide what is vital to be included, and prepare your wedding program wording.